This is my official GT3 Page. There are many posts about the every day happenings. This page contains my overall view. I will edit it as I learn more. My tadpole trike is a Greenspeed GT3. This is nominally the middle model in the range, GT1, GT3 and GT5. After that there are larger and more customisable trikes. I purchased my trike from the Clarence Street Cyclery. At the time, they were the only official distributor of the trike in Sydney. Initially I purchased the trike with the following factory options: front mud guards, pannier rack, SRAM Dual drive. To date I do not have much experience with these. Up front are Shimano Deore LX derailleurs and sugino cranks. When I had my first bike, a Malvern Star, I had a installed a triple chain wheel with an analogue feel like this chain wheel. But I think I have become soft and used to the changers which click from position to position. This derailleur moves smoothly through the positions. This means that I need to learn the correct position for middle gear. Top and bottom are not a problem as they are at the limit of the range. But I find myself often using the central chain wheel. I start in this gear. I only used the small wheel for climbing hills. When changing down in a hurry, I sometimes miss the central gear and go straight to the small cog. The SRAM Dual Drive extended the number of gears on the trike from 27 to 81. I purchased it for a few reasons. I had read in many many other peoples blogs that you need a good low range to get up hills when touring. I also felt that an effective overdrive gear would be handy as I find with my current bike that I run out of gears at the top end. Another initial reason was that one man on a blog had stated that the Dual Drive was good because it meant you could change gears while stationary. So if you had stopped in a hurry, and found your self in the wrong gear, you could still change up or down. One of the problems I have always had is that changing gears when stopping just makes the whole task of stopping quickly more of a hassle. At the moment I am finding that the centre chain wheel and largest rear cog is the best for a stationary start on the flat. I usually only switch down to the small front chain wheel on a steep up hill. Normally I leave the SRAM in the middle gear as this is the mechanical 1:1 gear with no losses. The upper and lower gears introduce some inefficiencies into the system. The book says that I have a Shimano Tiagra rear derailleur and cluster. (I will check this.) It works fine and has nice delimited clicks for the various gear selections. The only odd thing, that I am rapidly adjusting to is that the left (front) leaver selects towards the rear to go up a gear, and the right (rear chain set) selects to the front to go up a gear. So they are reversed. The SRAM has it’s own knob. I do not like the current position of this changer and plan to try a few different arrangements. 2009:10:20 I have been riding for some time now and I am much fitter. I find myself using the lower gears less. I have also moved the controller for the SRAM so that it faces back towards me. This is a much better arrangement and I can also read the gear position on the changer. I had a problem with the gear cable fraying after about 2,000 km. I suspect this is more to do with the places that I ride. I am constantly changing gears around here in Sydney as there are no long stretches on my ride to work. The range of the gears is a little low. The 16″ wheels are smaller than 26″ wheels. The distance travelled in each turn is only 37.9%. But my gearing is fairly standard gearing. So even with the extra 30% from the SRAM, I am still short of the tall gears a road bike would have. So I am considering getting a larger chain ring. My chain ring is 52 tooth. The other day I saw a recumbent with a 58 tooth gear. There will be a limit on how big I can go with the configuration of the derailleur. I have yet to work this out. Here is a good video on how to remove the SRAM gear changer box from the wheel. This needs to be done when removing the wheel. I have a pair of ortlieb panniers. They are just a little big and on the right side, the pannier sits on the gear change housing for the SRAM hub changer. This would not be an issue in a trike without this add-on. So I have added a bit of cloth for now that keeps the pannier off the housing. I will look for a longer term solution. Though this one is good as I can remove it easily if I need to. 2009:10:20 I have purchased some arkel RT-40 recumbent panniers from Greenspeed. I used them on the recent Cycle Queensland tour. The panniers are much bigger than the ortlieb. I am using the Ortlieb for the ride to work as they are more rugged, durable and water proof and using the arkels for touring as they are larger. I have found that different mussels are hurting. This was expected and is stated on the Greenspeed site. I expect that it will pass quickly. It is caused by the different riding position. At the moment I think that My chain wheel is a little too far extended. But I will leave it for a while to see if it is just me getting used to the new position or it really is a bit too far extended. After a week of riding I am really getting used to it and putting some strength into the peddling. I am pushing much harder than I would ever do on my old wedgie. This is because I can brace my back against the seat and also push with my back muscles. I am very tired as I am pushing so hard. I have also found that the muscles the trike uses are the same muscles as you use to climb stairs. As I have to climb 5 flights of stairs to get from the underground car park up into my unit, this means that after I get back from a tiring ride it is much more strain to climb the stairs. I have changed the configuration a few times now. On the first long ride I did, I suffered a sore knee. This persisted for a week or so. After some asking around and reading the manual I adjusted the pedal position to over 1 cm closer to the seat. This had an immediate effect and I was much faster. I rode on this configuration on Cycle Queensland. At CQ I met Hugh, who also ride a recumbent. On his recommendation I moved the cleat position on my pedal from the middle of the range to the end nearest the heel. I am no so sure about this change. On returning I moved the pedals again. This time a little over 1mm further away. Again this made a major improvement. I’d say that these changes all up have increased my speed by between 5 and 10 kmh. I would recommend getting the second mirror. They are very handy and useful. The only thing I can think of I would change is that they are too close to the centre of the trike. But as this is a physical layout issue of the trike, I do not think that there is anything that can be done about it. It is great to be able to look behind without turning around and to see if there are any cars behind. I have added a second pair of mirrors and this has been quite successful. They are Zéfal mirrors. I use one to look left and one to look right. One down side with the trikes design is that I sit further back and down low. On a normal bike you can usually see over the cars. But on the trike you need to see through them. This is a problem when pulling out onto a road when there are parked cars. You need to pull out about half a meter and often on a narrow road that is half a meter too far. I have mounted these mirrors on the bar that holds the chain wheel. The are great at seeing the oncoming traffic. The only thing I would change is to have larger mirrors and perhaps more curve. They have a limit of vision and I have them set up to work at 90°. But if I am on a different angle they are not so effective. 2009:10:20 These mirrors have worked well. But the design means that they are easily knocked out of alignment. When I do a major rejigging of the front end I will replace them with the same mirrors as I have for the rear vision mirror. 16″ wheels all around. Sturmey Archer hubs on the front, with the SRAM Dual Drive on the back and Greenspeed Scorcher slick tyres. When I got the trike from the shop they pumped the tyres to 100 psi. This is what is written on the side wall. Don’t do this. I had two punctures in a week. The ride is rock hard. Greenspeed recommend 80psi and this is much better. The ride is comfortable and the tyres work better. Time will tell if I get more punctures. 2009-06-10: well I had three punctures in three weeks. I would recommend if you use the Greenspeed Scorchers on roads littered with glass as we have here in Sydney you get the kevlar lined ones. I did not know they existed when getting the trike. I have replaced the tyres with Schwalb Marathon Plus tyres. These are supposed to be very resistant to punctures. I am getting road noise from the tyres which I did not get with the Scorchers. I have not pushed them yet in the wet. But I do notice that I have less rubber on the road. Even though the Scorchers were slicks, they had more rubber on the road. I did get the Scorchers to slip a few times in the wet on concrete. Also the Scorchers are baloon tyres which gives a smoother ride. 2009:10:20 I have not ridden a bike with hub brakes since my days as a child when I had a small back peddling brake bike. They are supposed to be between rim brakes and disk breaks in efficiency. Given that this is such a different machine, I’d say that they are better than rim breaks. I have never ridden a bike with disks so I cannot really say how they compare. Perhaps the greatest difference between the trike and a two wheeled bike, is the steering. Steering is done using the leavers on each side. They are connected in a negative scrub system that is very effective. The steering is smooth, though the turning circle is not good at 3.7 meters. So it is not like a bike where you can turn (slowly) on a dime or get off an walk it around. Now that I have the steering set up correctly (tighengin all the bolts on the frame correctly and with the correct amount of toe-in) it is very solid and true. It is very zippy around corners and obstacles, but perhaps a bit too sensitive at high speed. The greenspeed folds. As of yet, I have yet to do this. Here is a video of unfolding the trike. I folded and unfolded the trike several times when packing it to go to Queensland and return and I am starting to get the knack. I so have a problem with the seat pin coming loose when I have put the trike back together so I need to pay more attention to how tight the screw is. In the picture the trike is in a single, rearranged bike box. A little section on my own view as to why you would get a trike. Others have their own views and there is a lot of overlap and some differences. No need to worry about falling off. You can go very slowly. This is good when riding amongst pedestrians, children and dogs on shared pathways. It is very stable, which is a good thing on long distance touring. Low wind resistance means less effort to peddle. Lower to the ground means you are less visible. Being so far back (and in conjunction with the low height) means that you cannot see the on coming traffic when pulling out from between parked cars. Delta – A trike with two wheels at the back. Tadpole – A trike with two wheels at the front. Wedgie – a bike with two wheels. Arkel – I have a pair of the RT-40 panniers. Clarence Street Cyclery – The shop where I purchased the GT3. Cell Bikes – A near by bike shop (in Stanmore). Cyclecover – An insurance provider. Fuse Recumbents – A shop in Canberra. I purchase some specialised parts like the Schwalbe tyres. 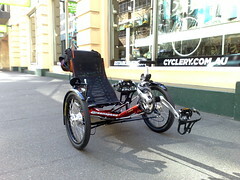 Greenspeed – Manufacturer of the Trike. King Street Cyclery – A near by bike shop (in Newtown). ortlieb – makers of my small pannier bags. Shimano – Manufacturer of the gear system components. SRAM Dual Drive – Manufacturere of the rear hub gears. Sturmey Archer – Manufacturer of the front hubs. Velosure – An insurance provide, and the one I am using. Woolys Wheels – A shop near where I work in Paddington.